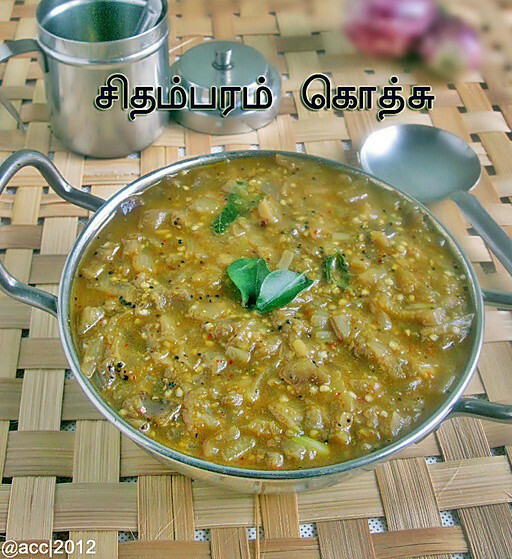 I got this Chidambaram Kathirikai gosthu / brinjal gosthu recipe from my friend Swarna. She had learnt it from a Chidambaram cook. I have tried this 3 times so far. Recipe for Kathirikkai gothsu powder is so simple. We can make it once & store for weeks. Basically I am a big fan of brinjal but my husband hates it. But the good thing about this recipe is he liked it a lot and gave approval to make it often. The consistency of this gothsu should be very thick like a paste but we love to have it in semi gravy consistency. As I haven't tasted the original authentic gosthu in hotel & temple style gosthu, I tried in both the ways and shared the pictures here. Please make it as you like. It tastes the best when made with sambar onions.So use small onions only. 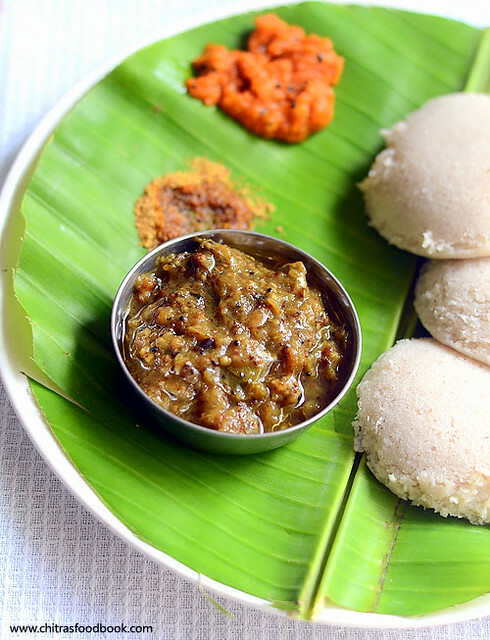 I heard this is the best side dish for Pongal.But we like to have it with idli. For gothsu powder, I followed my friend’s recipe but I saw so many variations in this recipe like adding methi seeds, toor dal etc. Anyways it tasted great. Please have a look at the notes section too. Do try and let me know how u like it. Lets see how to make Chidambaram special Kathirikai gothsu. Check out my another easy, one pot brinjal gosthu version HERE. Here is the old picture ! Dry roast dhania , chana dal & red chillies (1/2 tsp methi seeds – optional) in low flame for 2-3 mins till dhania starts to splutter. Make sure you dont burn them. Then grind them to a fine powder and set aside. Please add the mentioned amount of red chillies while making gotsu powder because if you reduce the chillies , gothsu powder may taste bitter and it will spoil the taste of gothsu. In that case , add little red chilly powder and proceed. Cut brinjal into small pieces and keep in water to avoid brinjal turning black in color. Cut small onions into cubes and set aside. Soak tamarind in little water. Heat a kadai with oil and add mustard seeds, urad dal and curry leaves & hing. Now add the small onions and saute till it turns transparent.. Then add the finely chopped brinjal pieces. Add the required salt. Saute till it shrinks and becomes mushy. Add little water if needed and cover cook the brinjal for sometime. Add the tamarind extract and cover cook till the brinjal is cooked well. Mash the brinjal with ladle but still some pieces should be visible.Now add 2 tsp of gotsu powder,mix well. Add little water if necessary.Boil it for sometime.The gravy thickens.Adjust the water if u want in thin consistency OR enjoy as it is !! Add coriander leaves for garnishing but it is not needed.Lastly add 1 tbsp of sesame oil on top of gravy.close it with a lid to retain the aroma. I’ve given the gothsu powder for larger amount which u can store n use. U can use 2 tsp of this powder for one time..
My friend told that the authentic version calls for burnini the brinjal in flame with skin and they mash it & add.But nowadays everybody follow this easy method. If u feel the gravy is bitter, u can try adding more tamarind extract because the bitterness completely depends on the brinjal we use. 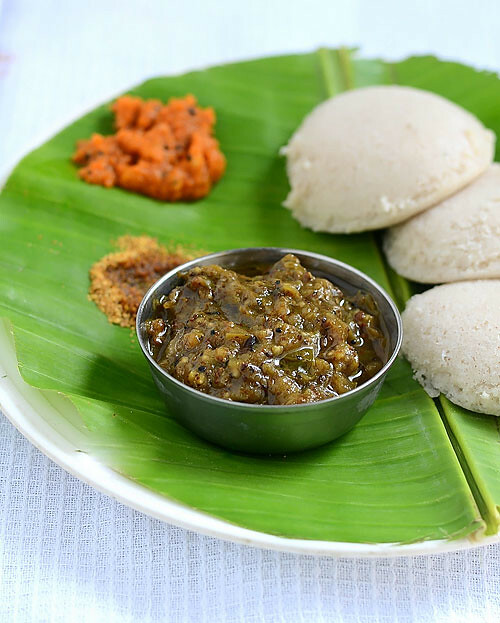 Enjoy this yummy side dish with Idli or pongal.Tastes yumm !! Drooling here!!! am bookmarking this delicious and yummy dish!!! my fav with ven pongal...yum..
An excellent pair for pongal, one of my grandma's signature dish. I have blogged this too long time back... I thought you knew this before. 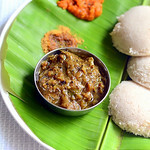 Since maami is also from chidambaram, the recipe is also ditto same which I have blogged :) We make very often too. I did your gothsu recipe. I modified it a little. Came out well.